Suspected terrorists approached Israeli border Wednesday morning, prompting IDF forces to open fire. At least 1 suspect was armed, says IDF. A group of Gaza Arabs approached the security fence separating Israel from the Hamas-ruled Gaza Strip early Wednesday morning, prompting Israeli security forces deployed at the border to open fire. The incident occurred along the southern end of the Gaza Strip, east of the Gaza city of Khan Yunis. Five suspects approached the security fence, and IDF spokesman reported, and at least one of the five was armed. IDF troops opened fire on the suspects, wounding all five. Gaza health officials confirmed that five Gazans were wounded by IDF fire in the incident. According to a report by Walla! News, Israeli security officials believe the five suspects had attempted to plant a bomb along the Israeli-Gaza border, with the intention of setting it off when the next IDF patrol passed by. The attempted bombing comes just hours after terrorists operating from the Gaza Strip opened fire at Israeli soldiers stationed on the border. No casualties were reported as a result of the terrorist shooting. Israeli forces responded with tank fire on a Hamas-held position in Gaza. 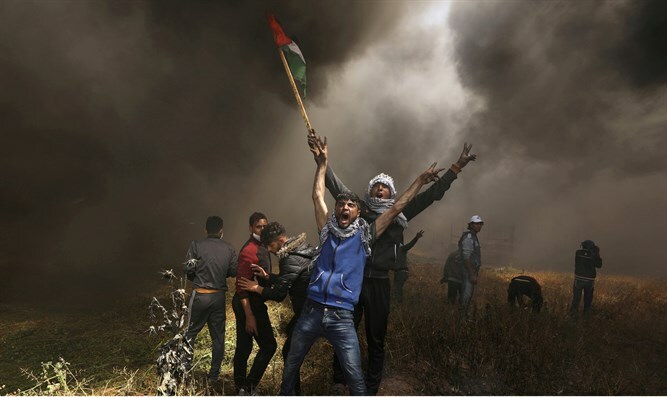 Tensions have been exacerbated on the Israel-Gaza border since the “March of the Return” began on March 30th, kicking off six weeks of riots and violent clashes along the frontier between Israel and the Gaza Strip. Thirty-three Gaza rioters have been killed during the riots, which began on “Land Day” - the anniversary of 1976 protests by Israeli Arabs against plans by the Israeli government to develop the Negev and Galilee. The riots are scheduled to continue through May 15th, the day after Israel’s 70th Independence Day, which Arab opponents of the Jewish state mark as “Nakba Day”, or “Day of Catastrophe”.